Eric Gales-- Eric WAILS !!! Talk about a churnin' urn of burnin' funk ! 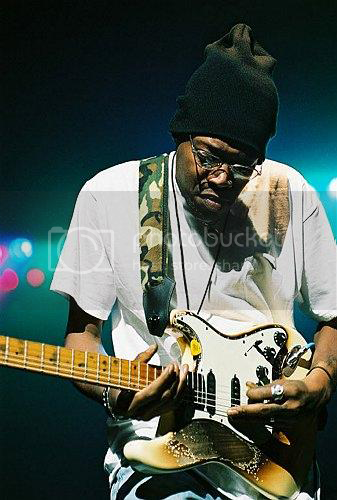 Let's talk about Eric Gales ! If you don't know about Eric Gales, it's high time you do. Eric was born and raised in Memphis, and comes from a big musical family. He plays his Strat left handed and upside down, ala' Albert King. Actually, playing this way is a family tradition passed down from Eric's grandfather. Check out the picture and see that the low E is closest to the floor. 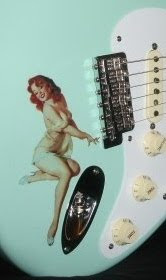 Albert King fans know the wicked vibrato that comes from grabbing those high strings and squeezin' them downward; like milking the cow. The man's gotta have a serious grip! Jeff Healey's over-the-neck approach gets a similar result. Eric's sound, tone and attitude are ultra-BAD too. Listen to "Retribution" on Eric's Myspace site. It's like the smell of jet fuel and the blast of F-15 exhaust in your face! Click the links to read more about Eric, listen to clips and check his tour schedule!